For more than 35 years, the care and treatment of patients with acute and chronic renal failure has been an important part of our daily work. Thanks to the progress in medical technology, the effectiveness of dialysis treatment has significantly increased in recent decades, thereby sustainably improving the quality of life of those affected. In our three outpatient health centres in Schopfheim, Müllheim, and Bad Krozingen, we rely on modern dialysis techniques and blood purification in accordance with the standards of international treatment guidelines – to provide you with optimal care at the highest level. Close cooperation with our regional partner clinics additionally ensures our mission of offering you a high level of medical quality and competence. Friendly and pleasant facilities await you, to make you feel at home during dialysis. Our experienced staff will be happy to help you with any questions, problems, or requests. 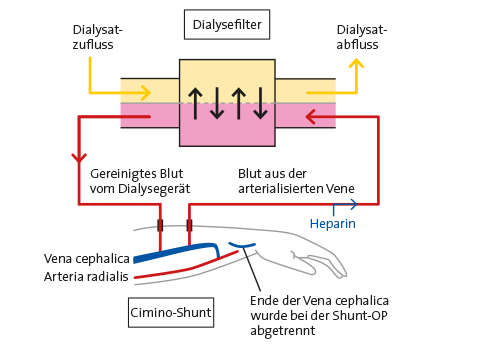 In haemodialysis blood is continuously withdrawn using a special vascular access (shunt), passed through a dialysis filter, purified, and finally introduced back into the blood steam. The treatment lasts four to five hours. Apart from haemodialysis, haemofiltration and haemodiafiltration are also among the dialysis techniques used in our centres. In this respect we use medical devices from the companies Gambro®, Nikkiso®, and Fresenius®. six hours, the liquid containing the bodily toxins is removed, and replaced by fresh dialysate.